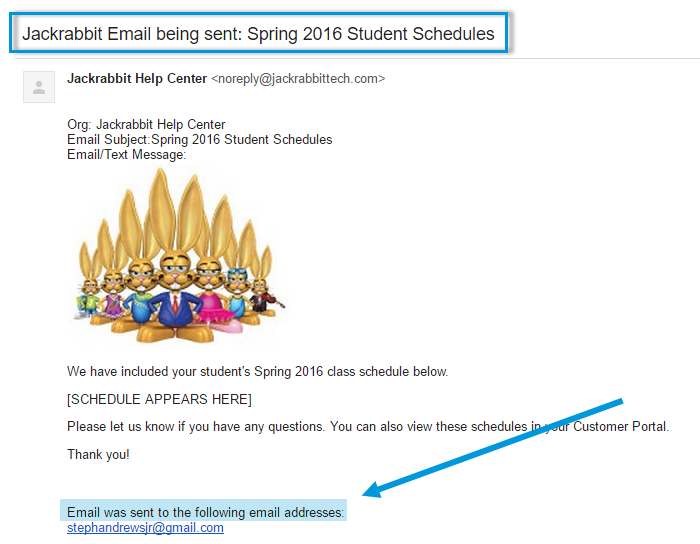 You can email families, or just students, their current schedule using Students > Email Student Schedules. 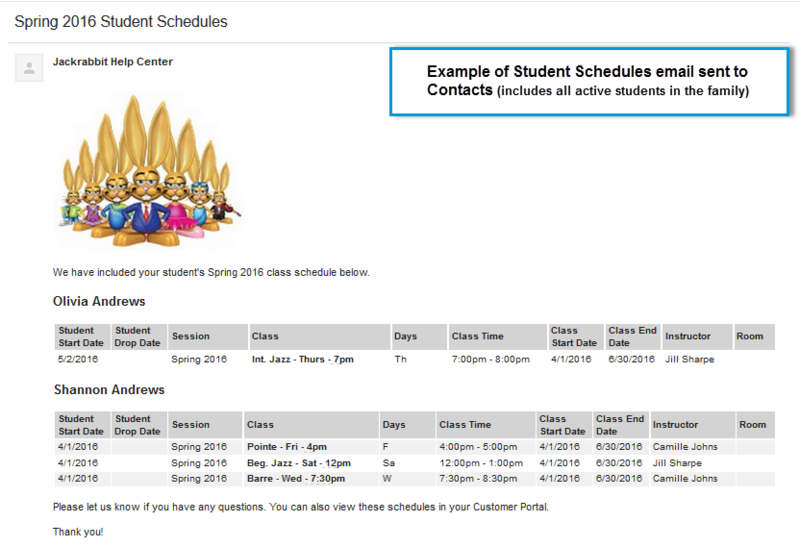 There are buttons conveniently located in each of the Family and Student records that allow you to quickly send off a schedule to an individual family (which will include all active students in the family) or an individual student (only their schedule is included). Note: Email Families & Email Student Schedules in the Families section must be selected as a permission for a user in order to use this functionality. To learn how to update user permissions, see Manage User IDs. 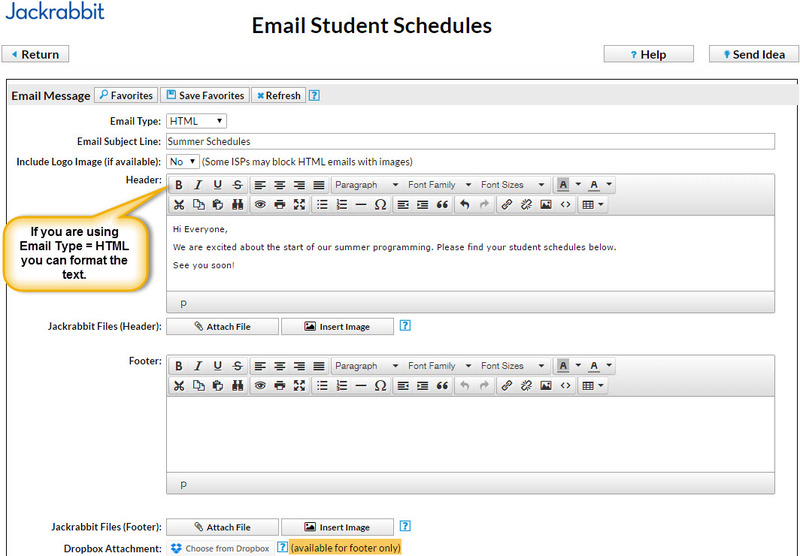 Point to Students in the main menu and click Email Student Schedules. Select an Email Type. For a full explanation of Email Type, see Email Type - HTML or Plain Text. Enter an Email Subject Line. Decide if you want to Include Logo Image. Note: You must have uploaded your logo in Tools > Edit Settings > Organization Logo. Enter a Header. Click Attach File or Insert Image to attach files and add images to the Header if needed. See the Help Article Email Attachments and Images for more details. Optionally, enter a Footer. Click Attach File, Insert Image, or Choose from Dropbox to attach files and add images to the Header if needed. Note: Dropbox attachments can be included in the Footer only. In the Schedules section select which student schedules to email based on Session and Categories. To include Future Enrollments change this setting to Yes. Enter your Display Settings. These settings tell Jackrabbit what you'd like displayed (or not displayed) in the email. For example, if you don't want the instructor's name included, set Show Instructor to No. In the Recipients section select who to Send Email To. You can send to Contact and Students, Contacts Only, or Students Only. The contact/student must have an email address on record. Contacts will receive the current schedules of all students in the family. Students will receive their current schedule only. Select a reply email address from Email Replies Sent To which includes the email addresses of all User IDs and Locations in your database (Tools > Edit Settings). 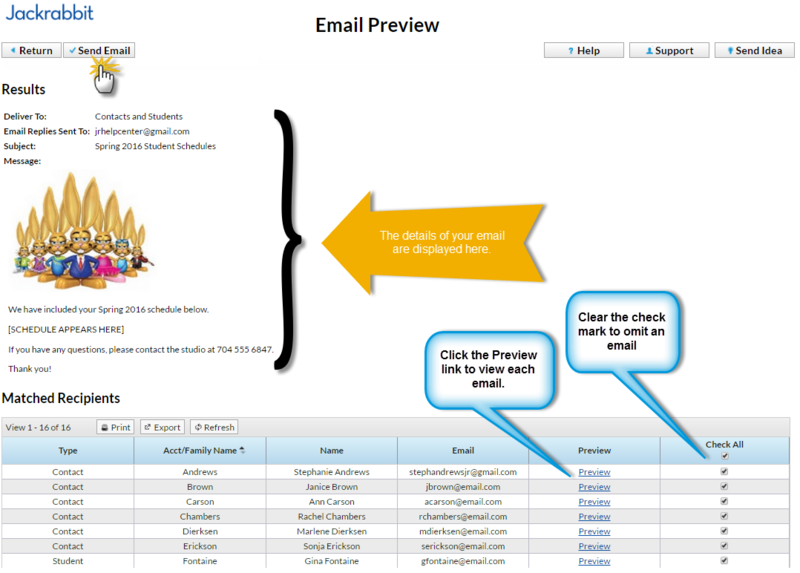 On the preview page, you can click any Preview link to preview an email. You can also clear a check box next to an email to prevent it from sending. When you are satisfied with the previewed list, click Send Email. A Success pop-up will display when the emails are successfully queued for sending. The emailed schedule is available in a family's email log (Family Misc tab > View Sent Emails button) for 180 days. When you are sending emails to multiple recipients, a contact found more than once via the search criteria will only receive ONE email; they will not receive the email multiple times. Example: If Contact 1 and Contact 2 share the same email address in a family record, only one email will be sent to this email address. Save a Favorite for frequently used headers/footers and criteria.